The whole PRECIA MOLEN Group in Privas. Last week, the whole PRECIA MOLEN group united at our historic headquarters in Privas, Ardèche. From New Zealand to the Netherlands, via China, India, Australia or Brazil, all world regions were represented. It was the occasion to meet our new colleagues from our American subsidiary J&S Weighing Solutions, and from CAPI, now PRECIA MOLEN West Africa, based in Ivory Coast and Burkina Faso. 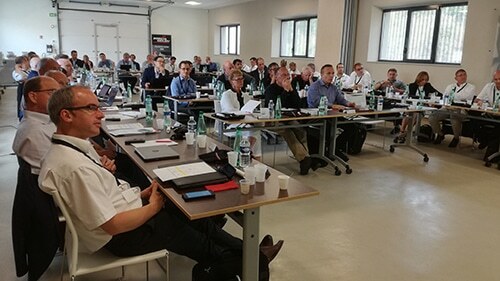 During these three days, attendants watched R&D and new product presentations, for example on our new i25 touch indicator that will be marketed worldwide in September 2017. Workshops were set up to show our new weighing solutions, either recently or soon to be offered. The focus this year was on connectivity and generally the development of new technologies but also in our way to design products and to communicate together. These intense work days were followed by typical evening events, either in renown restaurants or in local sites, for everybody’s pleasure. This annual Group Meeting allows everyone to communicate on issues with colleagues from other geographical areas, or directly with the R&D department. It also gives the opportunity to work together towards the development of the group through emerging ideas and information.